Alden Ehrenreich and Joonas Suotamo walk through a desert planet in "Solo: A STar Wars Story." Maybe you’ve heard about all the press reports that leaked out beforehand about Solo: A Star Wars Story being plagued by trouble, with original directors Phil Lord and Christopher Miller (from The Lego Movie) being fired and replaced by Ron Howard. Sometimes movies show the marks of their production troubles, like Justice League did. With this one, you can’t tell. Solo is efficient entertainment and no more than that, but it’s also no less. This prequel begins on the planet Corellia, where petty smuggler Han (Alden Ehrenreich) and his girlfriend and partner in crime Qi’ra (Emilia Clarke) have amassed enough wealth to get off their planet and as far away from the Empire’s control as possible, with Han dreaming of one day owning his own ship. Unfortunately, an Imperial patrol snatches her up just as they’re fleeing, and Han vows to return for her. 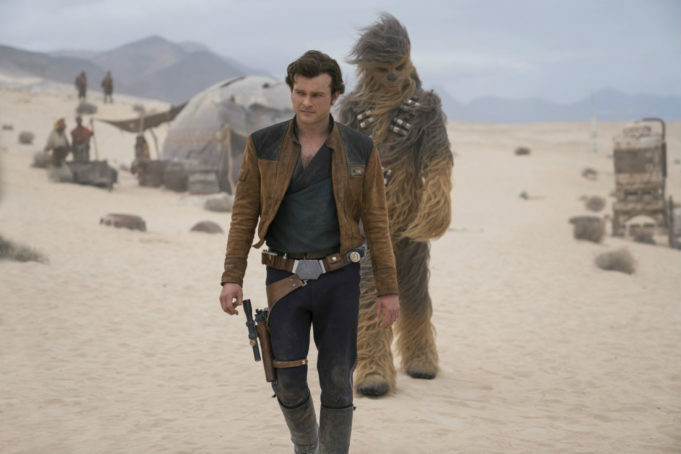 His first thought is to enlist with the Empire as a pilot, where a bored government clerk assigns him the surname “Solo,” but Han can’t stand the drudgery of military life and deserts to join a gang of thieves led by Beckett (Woody Harrelson). The main thing I take away from this movie is the glimpse it gives us of the Empire’s underbelly, which is not pretty. The bad guys in charge are paying racketeers under the table to provide them with slave labor and resources from conquered planets. At his first sight of the land-stripped planet Kessel, Han says, “Mining colonies are the worst.” (Beckett responds, “The worst is where the money is.”) It would be nice if the script by Lawrence Kasdan and his son Jonathan followed up on this critique of the Empire’s imperialism in a meaningful way, but the movie’s narrow scope fits with the way Han doesn’t fully comprehend the Empire’s corruption yet. Much of the bad publicity for this movie has centered around the lead actor, and while Ehrenreich isn’t terrible here, he does seem trapped in a Harrison Ford impression. By contrast, Donald Glover brings his own easy bonhomie to the role of the card-cheating bon vivant Lando Calrissian. Unburdened by the ghosts of old characters, Clarke makes a crisp impression as Qi’ra makes her own way through the galaxy, while Paul Bettany layers a patently phony facade onto his role as a crime kingpin. Most of the movie’s scant comic relief comes from Phoebe Waller-Bridge as a highly opinionated feminist droid who works with Lando, and if you haven’t experienced this British comic dynamo, this movie makes a nice introduction to her. Ultimately, Solo is held back by the same considerations as Rogue One, even though it is more engaging. We know that Han is going to meet Chewbacca (Joonas Suotamo) and win the Millennium Falcon off Lando, and seeing it happen doesn’t deepen our understanding of these characters or the universe they operate in. That’s the trouble with these prequels: Unless they’re done inventively, they kill off the fun in a tantalizing backstory. Howard and Kasdan have their virtues as filmmakers, but fecund imagination isn’t one of them. 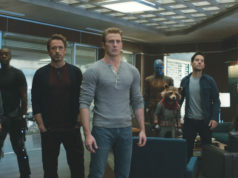 They do make this watchable and keep it from any dead spots, but this movie still feels like a franchise tie-in, like the cheap plastic toy that comes with the Happy Meal. It’s inessential. Starring Alden Ehrenreich and Emilia Clarke. Directed by Ron Howard. Written by Jonathan and Lawrence Kasdan. Rated PG-13.